The Central Valley (also called the Great Central Valley) is a very large valley in the middle of California, in the United States. About 42,000 square miles (108,779 square kilometers) in size, it is about the size of the state of Tennessee. 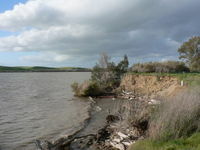 It consists of two connected, differently named valleys, the Sacramento Valley and the San Joaquin Valley. The Sierra Nevada Mountains border the valley on the east side, while the Coast Range borders it on the west side. The Sacramento River flows through the north part of the Central Valley. This part of the valley is also called the Sacramento Valley. The San Joaquin River flows through the larger south part of the Central Valley. also called the San Joaquin Valley. Both rivers merge eventually and empty into the Pacific Ocean via San Francisco Bay. The capital of California, Sacramento, is located in the north part of the Central Valley. In total, the Central Valley is around 450 miles (720 km) long. The Central Valley has 18 California counties. 15 of these counties are among the 25 most productive farmland in California. Overall, the Central Valley economy depends on farming. However, this has led to serious environmental damages, such as pesticides and selenium and other bad materials being washed into the rivers and polluting the San Francisco Bay. Map of California counties, showing population density. Less populated counties are in lighter color. The Sierra Nevada mountains are on the east side of the valley. These mountains are very tall and steep. Lots of rivers and streams flow off the Sierra Nevada. The highest mountain in the Sierra Nevada is Mount Whitney (14,495') which is also the tallest mountain in California and the rest of the United States (except for Alaska and Hawaii). On the west side, there is the California Coast Ranges, an extension of the Pacific Coast Ranges. Its highest point is approximately 8,848'. A view of the Sacramento River. The Sacramento River begins in the north part of the Central Valley, near Mount Shasta. It actually begins in the Cascade Range, which are mountains north of the Central Valley, though most of its length is in the Central Valley. The Sacramento River flows south about 447 miles (719 km) to San Francisco Bay. Some of its tributaries include the Pit River, Feather River, and American River. All these rivers come off the Sierra Nevada. The San Joaquin River begins at the south Sierra Nevada, and flows west and north into the Central Valley and to San Francisco Bay. Altogether, its length is sone 330 miles (530 km). The San Joaquin is more polluted than the Sacramento, and about 63 miles (101 km) of it is actually dry. Together, the Sacramento-San Joaquin river system is the water supply of 22-23 million people in California. Areas with Mediterranean climate around the world. The climate of the Sacramento Valley (north Central Valley) and San Joaquin Valley are very different. The Sacramento Valley has a Mediterranean climate. This means that it has warm, dry summers and cool, wet winters. The San Joaquin Valley is much hotter and drier. Most of it is Mediterranean steppe, which is similar to Mediterranean except that it is warmer and drier. Some of it, however, can be close to desert climate. This section of the Central Valley is said to have the worst air quality in California. However, since most of the land area of the Central Valley is devoted to farming, the population density (amount of people divided by land area) is actually quite low. 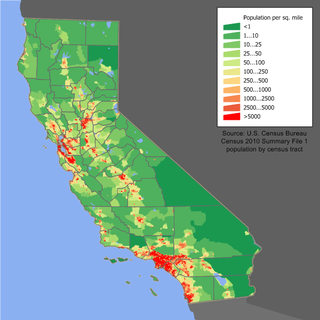 The population density of the Central Valley is 155 people per square mile (60 people per square kilometer). In contrast, the population density of Los Angeles, the biggest city in California, is 25,904 people per square mile. This picture of the Central Valley shows the many farms in it. Farming (agriculture) has always been the main economy of the Central Valley. Except for the city of Sacramento, where the focus is on the government, the rest is mostly agricultural. Immigrants provide a large amount of the work done in farms in the Central Valley. Overall, 12.3% of jobs in the Central Valley are directly agriculture related. Not including Sacramento County, the percentage is 16%. The main road transport routes through the Central Valley are Interstate 5 and California State Route 99. These two highways run from north to south. Interstate 5 is the larger of the two, and carries more traffic. Highway 99 is older than Interstate 5. The Highway 99 separates from Route 5 at the south end of the Central Valley, and joins again at the north end of the valley. Amtrak is one of the main rail service providers in the Central Valley, and is also popular in much of the rest of California. ↑ 1.0 1.1 "Central Valley (valley, California, United States)". Retrieved 2009-03-28. ↑ 2.0 2.1 "The Central Valley is a large and diverse area". Retrieved 2009-03-28. ↑ "Mount Whitney". SummitPost. Retrieved 2009-03-28. ↑ "Sacramento River Atlas". Retrieved 2009-03-28. ↑ 5.0 5.1 "Restoring the San Joaquin River". Natural Resources Defense Council. Retrieved 2009-03-28. ↑ "Mediterranean or Dry Summer Subtropical Climate". Retrieved 2009-03-28. ↑ Calculated by dividing population (6,500,000) by land area (42,000 square miles or 108,779 square km), and rounding to nearest whole number. ↑ Calculated by dividing population (12.9 million) by land area (498 square miles) and rounding to nearest whole number. ↑ "Agriculture-Based Economy". Retrieved 2009-03-28. ↑ "Interstate 5". Interstate-Guide.Com. Retrieved 2009-03-28. ↑ "Central Valley Project General Overview". United States Bureau of Reclamation. Retrieved 2009-03-28. This page was last changed on 19 August 2014, at 00:47.